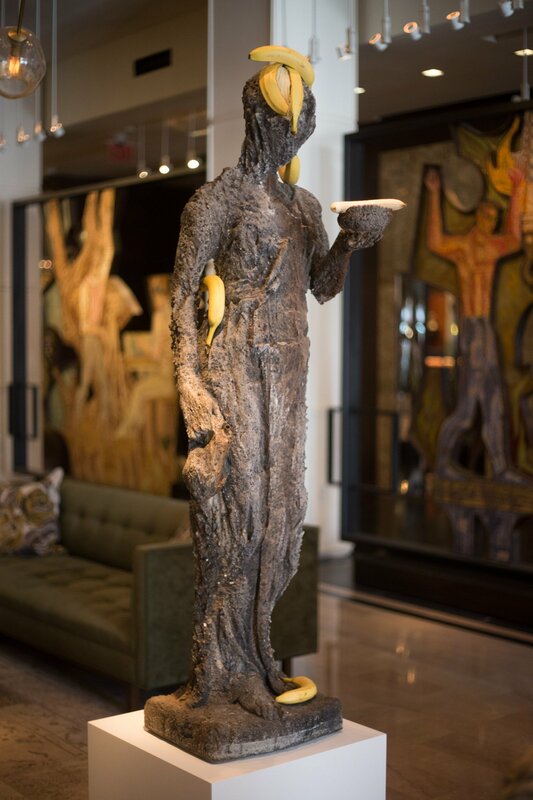 The hotel has a series by the New York artist on view for Dallas Arts Month. If you’ve been to The Joule, you’ve likely noticed its robust art collection—the giant yellow shell, the crystallized engine, the Byzantine-looking mosaic in front of the elevators. The hotel’s latest installment might catch you off guard, though. The scene in the lobby entrance off Main Street is jarring. It looks like a bag of groceries broke over a graveyard of weathered votive statues. This is New York artist Tony Matelli’s strange “Garden,” a selection of sculptures on loan from Marlborough Contemporary for Dallas Arts Month (on view throughout April). The series combines decay and perpetual bloom, putting hyperrealistic bronze fruit and meat atop classical figures made of sandblasted concrete. 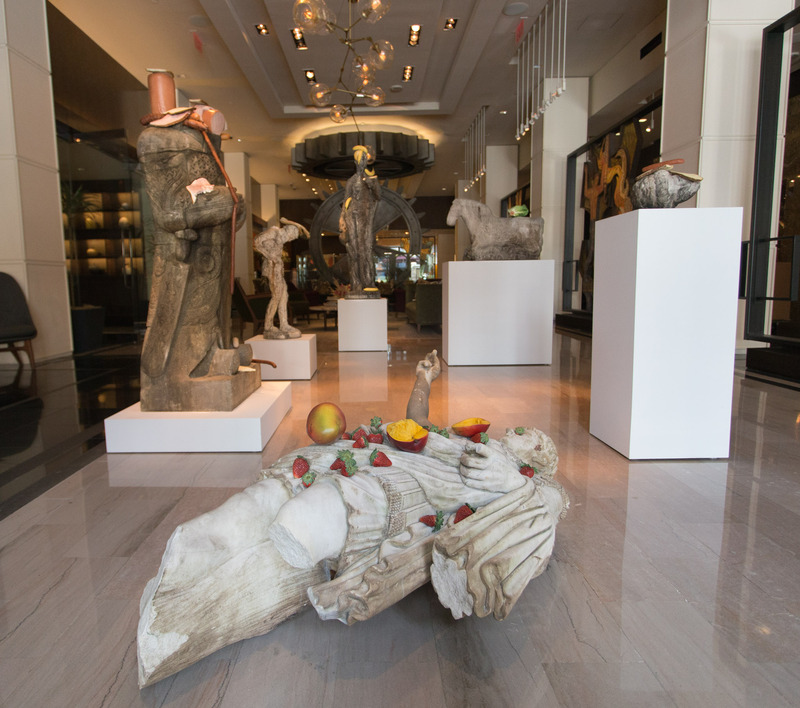 The most lovely specimen is closest to the door when you walk in: a broken statue of an ancient man laying on its back, with a strawberry covering its eye and a stringy, half-eaten mango on its heart. It’s weird but beautiful, the fruit glimmering and ripe on the dull concrete. Behind this piece, things get a little less appealing. 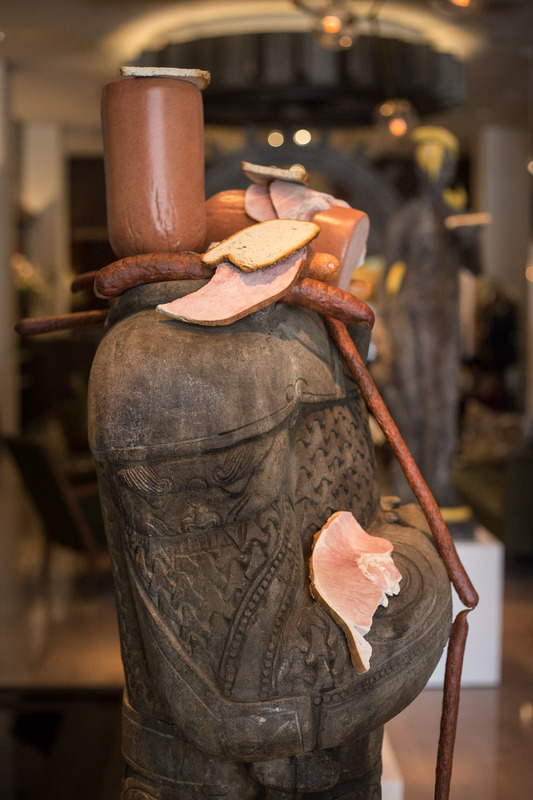 Sausages, blocks of lunch meat, and thick slices of marbled ham have replaced another statue’s head in an unsettling pile. To the right, a decapitated head balances a hot dog and a stale bun on its side. Behind these, a smaller statue is crowned with crab legs. A head of romaine, as green as if it had just been taken out of the crisper, is hastily thrown on a horse’s back. The final artwork, furthest from the entrance and presiding tall over the others, provides comic relief. A rough, robed figure, sandblasted past the point of recognition and not-a-little-ominous, is adorned with spotted bananas. Two–one peeled and one whole–are worn as a hat, one as an earring, one tucked under its arm, one in its hand, and one at its feet. The series is a little bit gross, a little bit funny, a little bit sensual, and very different from anything else I’ve seen in Dallas lately. Stop by The Joule if you want to take a look.